Cook those bones! 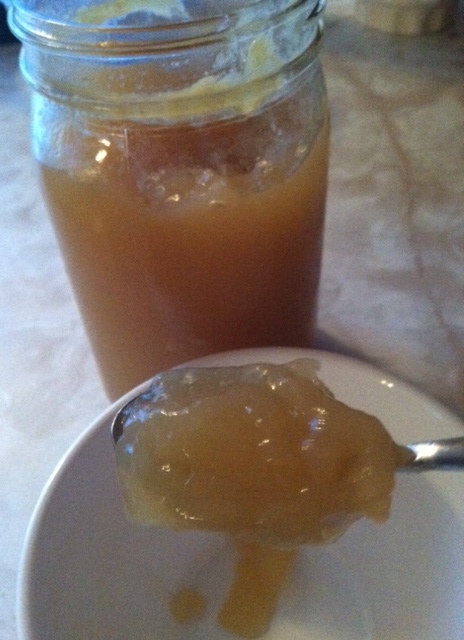 Turkey Stock recipe…! One of my favorite things about the day after Thanksgiving is putting the carcass and all the bones up for turkey stock! For those of you who would like one, here’s a recipe. Enjoy!! 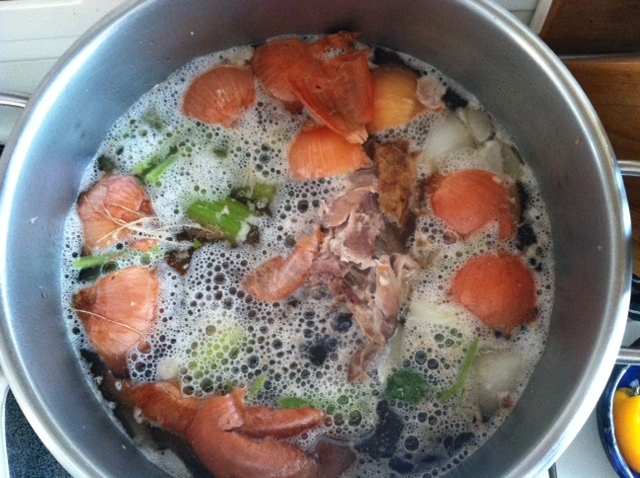 Turkey stock with scum. I added the vegetables with the bones, so I’ll have fun skimming around the veggies! Skimming the scum off the turkey stock. I am using a skimmer, but you could also use a spoon or ladle, which I did for years! Bring the pot to a boil again if you just added vegetables. Lower the heat to a simmer. The temperature that your stock cooks at is important. You will be at a perfect temperature when you see movement under a relatively still top of the stock. You will know that the stock is “done” when all of the cartilage has been dissolved and you can crumble the bones in your hands with light pressure. 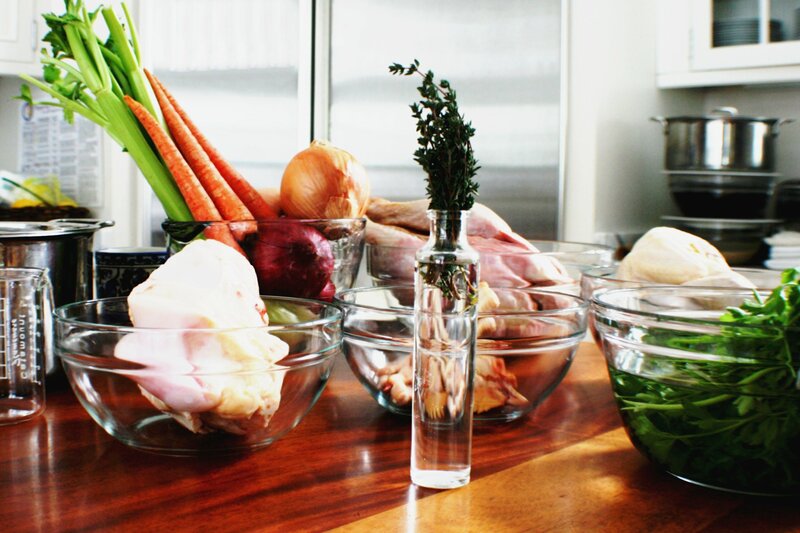 Strain the stock and cool to room temperature before placing it in the refrigerator. 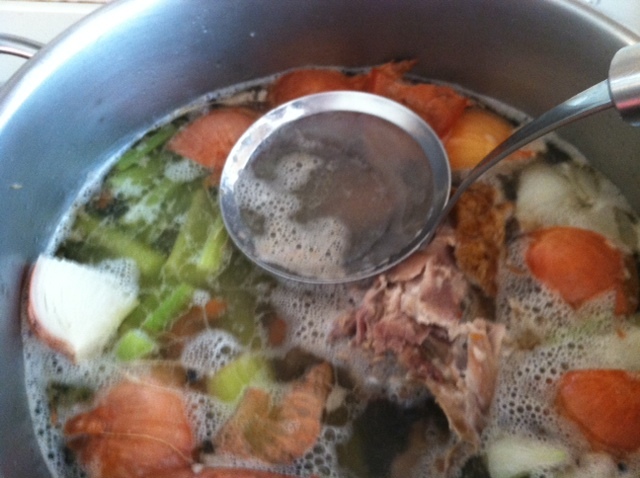 Hint: a long and shallow pan will allow the stock to cool more quickly because of the increased surface area. Cooled turkey stock! The top layer is fat; very good for cooking! 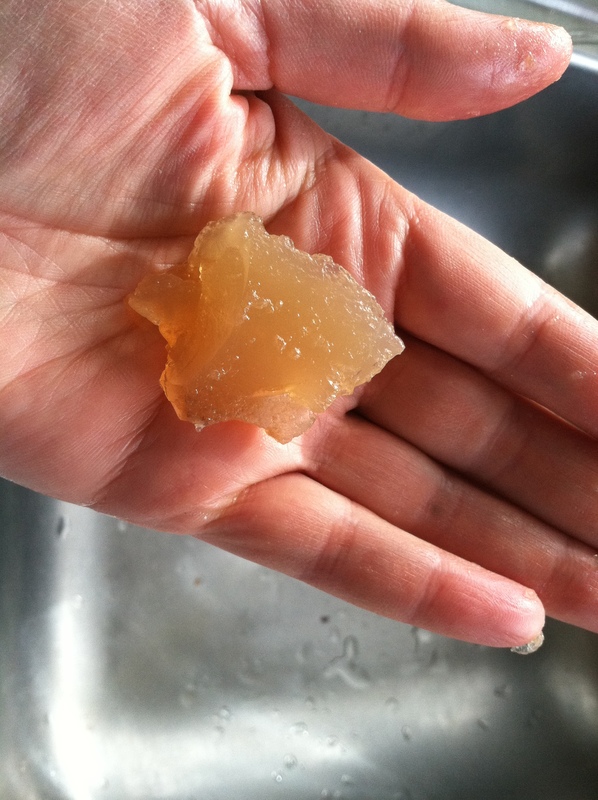 When the stock is truly gelatinous, you can cut a cube and hold it in your hand! Wild Rice Stuffing with Sausage…Gluten-free Thanksgiving Delight! First of all, please know I am thankful for all of YOU! I thought I’d share the recipe I’ll be serving on our Thanksgiving table, as I have often been asked for a bread-free, gluten-free, real food stuffing for Thanksgiving. I hope you enjoy it! Wild Rice Stuffing with Sausage! Bring stock to a boil and skim any scum. Add wild rice or wild rice blend and salt, and bring to a boil again. Reduce heat to low and cook covered until rice is tender and has split open, about an hour. Drain well in a colander and set aside in a medium bowl. (You may retain the stock from the colander to use later.) Note: if you use a wild rice blend, you will not have any stock to drain! Sauté sausage in very large skillet over medium-high heat until cooked through, breaking into pieces with spoon, about 15 minutes. Using slotted spoon, transfer to large bowl; add wild rice. Add onions and celery to same skillet and sauté in the sausage fat until golden brown, about 10 minutes; remove and add to sausage and wild rice mixture. 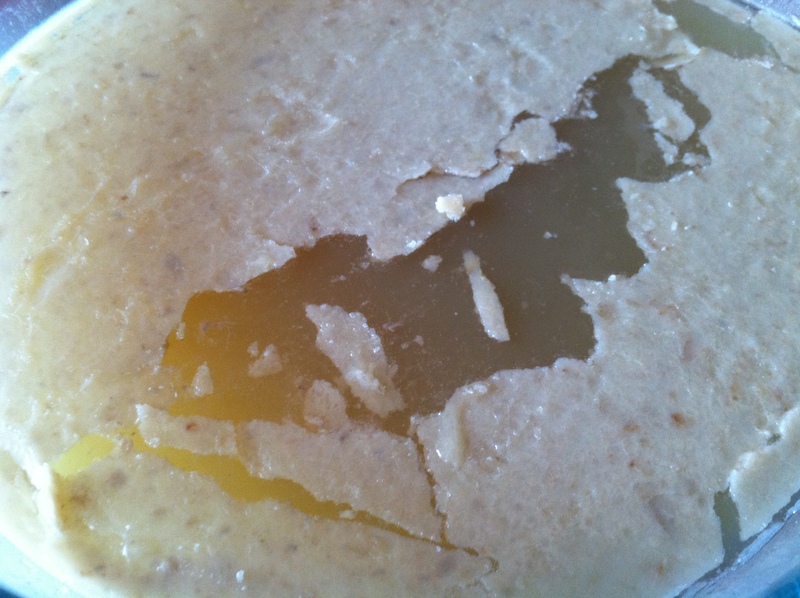 Melt 1/4 cup butter in same skillet over medium-high heat. Add apples and sauté until tender, about 8 minutes; mix apples into wild rice mixture. Melt 1/4 cup butter in same skillet. Add sage and sauté until dark green, about 2 minutes. Mix sage and butter into wild rice mixture. (Alternatively, melt the butter and pour into wild rice mixture, adding ground sage and stirring well.) Season with salt and pepper. Add raisins or dried cranberries to wild rice mixture. Preheat oven to 350°F. Bake stuffing covered until heated through, about 1 hour. Uncover and bake until beginning to brown, about 10 minutes. Now you have stuffing! Note: You may also stuff the turkey with this mixture. Just place any that does not fit into the cavity in a buttered glass baking dish and bake as above. Stuffing the turkey will increase the amount of time you will need to bake the turkey.